“C” You in the Major Leagues Foundation and Blue Cross and Blue Shield of Kansas City (Blue KC) have announced award-winning gymnastics coach Jessie Rood as the July Blue KC Coaches with Character honoree. Shawnee Mission Northwest staff and teachers see first-hand how Rood interacts with her student-athletes every day. Rood was nominated by Northwest athletic trainer Daniel Fletcher. 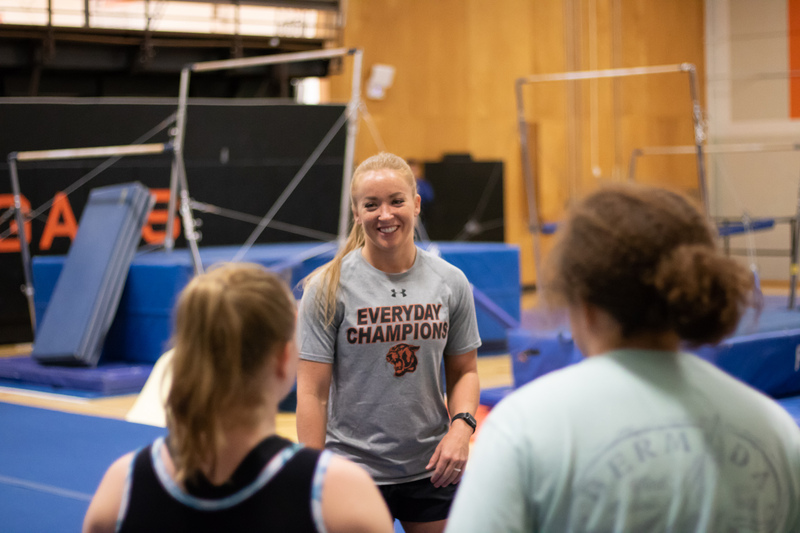 After competing as an elite-level gymnast herself, Rood saw an opportunity to continue bringing a competitive fire and passion to others through coaching. She has built a successful coaching career by continually reinforcing good practice habits and mental toughness in her young athletes. “I have four rules in my gym: (1) Listen to your coach; (2) Support your teammates; (3) Work hard and honestly, and (4) No whining. These are posted everywhere in my gym. They remind my girls that once you step foot inside a place where your job is to put your head down and work, you set everything else aside in order to focus,” Rood said. Rood has been recognized by the Kansas Association for Health, Physical Education, Recreation and Dance as the 2018 Kansas High School Young Professional of the Year and was also the recipient of the 2007 Kindest Kansas Citian Award. She has led her Blue Valley Xcel team to four state championship titles. Shawnee Mission Northwest finished third in the state in 2017. Rood’s student-athletes know up front the priority she places on academic excellence before athletic excellence. She maintains, however, that the two go hand-in-hand. A joint venture for Blue KC and CYITML, the Blue KC Coaches with Character program spotlights amateur coaches who, through their leadership on and off the field, are helping to grow youth sports in the Kansas City area, and making the community a better place to live, work and play. Selected from nominations submitted by fans, with one honoree announced each month throughout the 2018 MLB season, each Blue KC Coaches with Character honoree will be interviewed on 810 WHB, receive a VIP gift package from Blue KC and CYITML and will be invited to meet Royals General Manager and CYITML Founder Dayton Moore at an event in September at Kauffman Stadium. Additionally, Blue KC will make a $2,000 donation to CYITML in honor of each selected coach. To nominate a coach, click here.